WTI oil stands at the back foot on Friday and eases to $59.30 after bulls ran out of steam and failed to close above cracked $60 barrier in repeated attempt. Overbought daily studies and bearish divergence on slow stochastic suggest consolidative / corrective action in coming sessions, as traders take profit from rally of past two-weeks. Doji reversal pattern is forming on daily chart and today’s close in red is needed to complete the pattern and signal further easing. Corrective action would face initial support at $58.67 (10SMA) which should ideally contain, however deeper dips cannot be ruled out and should find ground above rising 20SMA ($57.47) to keep larger bulls intact and prevent deeper correction. Oil prices remain supported by production cut by main oil exporters, as well as US sanctions on Iran and Venezuela, while stronger than expected draw in US oil inventories last week, further inflated the price. 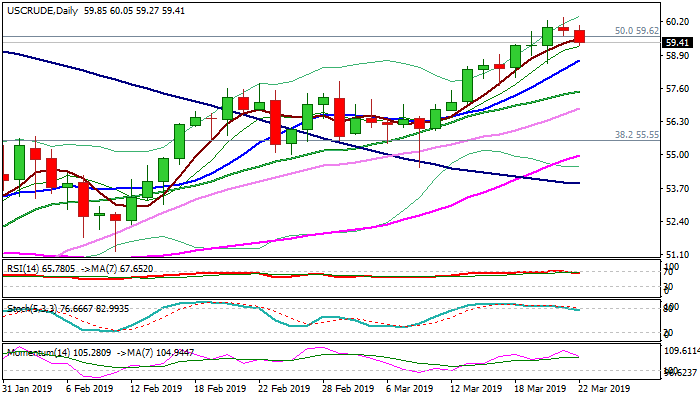 WTI contract is on track for the second straight bullish week, but weekly close above cracked Fibo barrier at $59.62 (50% of $76.88/$42.36) is needed to signal bullish continuation.